This is one of my absolute favorite slow cooker recipes. It's easy enough for a weekday but also doubles as an excellent entertaining recipe. It takes all of five minutes to add all of the ingredients in the slow cooker, turn it on and you're done. The flavor resembles a sweet barbecue sauce but the addition of cranberry gives it a more sophisticated flavor. The ideal cooking time for this recipe is 1 hour on high and then switching the setting to low and cooking for an additional 3 hours. However, this was not an ideal cooking time when I was working, leaving my house at 6:20am and not returning until 4:00 in the afternoon. In that case I would do one of two things; turn it on low for 8 hours before leaving in the morning or have my husband sneak home during his lunch break and turn it on low for 5 hours. In both cases the slow cooker would switch to warm and be ready for us at dinner. If you do choose to use one of the longer cooking times, you will end up with more of a shredded pork kind of dish. Still moist, delicious and saucy with less of a fancy presentation. Serve with rice and easy steamed green beans or broccoli. 1. Inside slow cooker, stir together chili sauce, cranberry sauce and brown sugar. 2. Season the tenderloin with salt and pepper and place in slow cooker. Roll it in the sauce. see cooking time options above. Garnish with fresh rosemary and cranberries if you're feeling fancy! Prep Ahead Plan: Take 5 minutes the night before and mix all of the ingredients in the slow cooker and store in the fridge until ready to turn on! 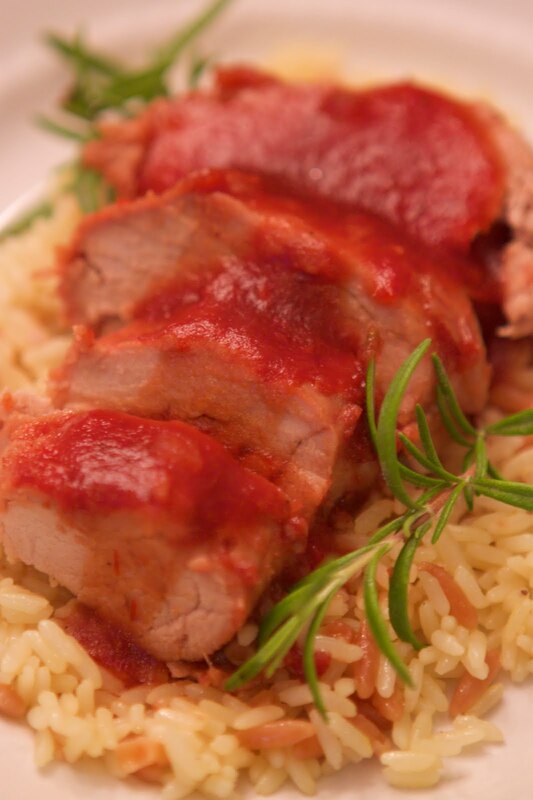 Copyright © PrepAhead and Dine In: sweet and saucy pork tenderloin (slow cooker). All Rights Reserved.